Montclair is a pretty city in the Pomona Valley. This city has a wide array of fun activities for the whole family. Whether you are checking out the Carillo Park or enjoying an evening at the Candlelight Pavilion Drive In Theatre a toothache can ruin the mood quickly. You never know when a toothache can come on but one thing you know is they must be treated as quickly as possible to prevent further damage. Montclair has many dentists and specialists to choose from to help you during your dental emergency. When it is time to find a dentist in Montclair, CA, emergencydentistsusa.com has what you need. Our team has put together a list of local dentists and dental specialists to present to you. All you have left to do is go through the list, choose the dentist that best suits your needs, and set up an appointment. If you are in a hurry, or have trouble seeing the list at the moment, call our toll-free dentist finder hotline to help. Our hotline associates are specially trained to listen to you and your needs. They listen so they can best identify the dentist you require. We go through the area options and let you know who is close by and what their hours of operation are. From there, you tell us what dentist best fits you and we will set up your first appointment for you. It is best for you to arrive 15 minutes prior to your appointment to give you time to fill out any necessary paperwork and to ask any questions you might have. Bring your ID, insurance card, and any payment you may have. If you are new to the Montclair area, concern over where to get emergency dental care may feel overwhelming. There are many quality options when it comes to dentists and specialists in Montclair, CA. Before you seek treatment with a specialist, it is recommended that you go talk with your general dentist first. If he or she sees a need for a visit to the specialist, they can refer you to one. Description: First Dental Group is a father/son dentist team who makes your smile the top priority. Their mission is to get you in and out of the dentist as efficiently as possible while providing quality care and minimizing pain. The office has state-of-the-art dental technology and techniques. A few of the services they provide include exams, fillings, root canals, cosmetic dentistry, crowns, and more. The office accepts most PPO, HMO, and Denti-Cal insurances. Description: Shine Dentistry’s mission is to help you keep your gums and teeth healthy and beautiful. We work closely with you to help you achieve optimal oral health. We provide many dental treatments from basic to advanced including root canals, crown, extraction, whitening, filling, and more. Our office accepts most payment options along with most major insurance. We are also pleased to accept CareCredit and Springstone. Doctors: Dr. Vijay Patel, B.D.S., Dr. Thomas Spinosa D.M.D, Dr. Dave Srikureja D.D.S, Dr. Faustino Zuniga, D.D.S. 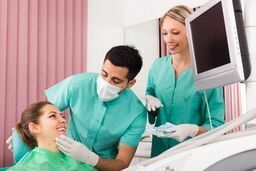 Description: Montclair Dental Office takes care of the general dental needs, orthodontics, and cosmetic dentistry needs of all our patients. They work out specialized treatments and offer quality service. Taking care of smiles is their specialty. A toothache can cause so many issues if it is not treated promptly. Any tooth pain that lasts longer than an hour or two needs immediate attention from a dentist. If the pain is due to an accident, a trip the ER first is recommended to rule out further injuries. Before you make a trip to a new dentist, take the time to check that their licenses are all up to date and active. To accomplish this, go to the California Dental Association website and perform a search of the dentist’s name.